Divestment – It’s Time to Shun the Gun | Idealist Girl! Let me begin by saying that I am all about gun control, and always have been. As a vegetarian and a pacifist, I do not understand the need to have a gun to kill other living beings, animal or person. I do not understand target shooting as a “sport.” And frankly, I do not care to. I like to imagine that human society can evolve to a place in which we can solve our problems like adults and without needing to blow each other up to prove the supremacy of our ideals. I cannot imagine that human beings need to lord their opposable-fingered capabilities over the so-called “lesser” animals by shooting them unless the human beings are starving to death. Which in present-day America is unlikely. However, I am no Pollyanna. Given the human condition, I am glad that armed and trained police and military are available to protect me and my fellow Americans, and to intervene internationally when called for. I am also glad that the rabid-Second-Amendment-defending-nut-jobs I see interviewed on TV are not part of that group. No matter how passionately they argue, I would never want them as part of a “well-trained militia.” In fact, the thought that they and thousands of their brethren are out there hoping for that outcome scares the pants off me. And loops me back to being glad about those armed, law enforcement types. I do not interpret the Constitution literally. Having majored in writing and studied the proper exegesis of the Bible, I am unlikely to argue that the written word can ever be taken completely literally. I disagree with a fundamentalist approach to the interpretation of the Constitution in the same way that I disagree with a fundamentalist interpretation of the Bible: I don’t believe that the whole of truth can be contained in one written document. I also believe that morals and values are dynamic, capable of evolving as human thought and understanding changes. If all the truths we needed to govern our country were obvious in 1787 we would not have amended the Constitution twenty-seven times (so far). I won’t argue for modifying the Second Amendment, because I know that in this country, that will never happen. Or at least not in my lifetime. However, I think it is obvious to almost everyone that we have a problem with gun violence in this country that needs to be addressed head on. 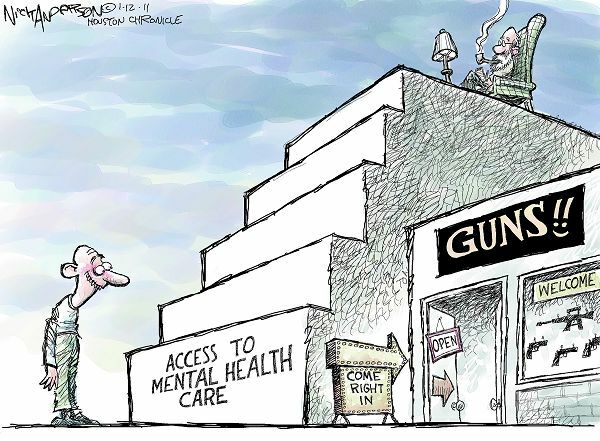 And we aren’t going to get far in the discussion until we start looking at who is profiting from gun sales. Because in America, with our devotion to the so-called free market, the reason anything gets manufactured and sold is because somebody is profiting from it. And that needs to stop. No one should be making money off the sale of guns that are being used to mow down classrooms full of children, theaters full of movie-goers, or mini-van driving dads just out running errands. In effect, we Americans have readily handed over to corporations and profiteers the regulation of our morals. Oh yes, we will turn a blind eye when said profiteers hide behind the militant 2nd Amendment defenders, pretending that the ready availability of assault weapons and guns exists because of consumer demand. But that is a load of bull and we all know it. Those guns exist in the consumer market because some manufacturer decided that they weren’t earning enough profit from defense contracts, and so they should introduce a variant of these weapons into the marketplace. And places like Walmart, K-Mart and sporting goods stores decided they could profit by selling them. And someone else thought it would be a great way to make money by holding gun shows. Consequently, weapons that can kill multiple people in short order, and which to my way of thinking should only be possessed by law enforcement officers and soldiers, are in the hands of untrained and not-screened-for psychiatric-health amateurs under the pretense that they might need to form a militia or that it’s the best way for them to slaughter some hapless woodland creature. Where, in all this, is my right (and yours) to go to a movie or send our children to school without worrying that we are going to be gunned down by some madman? Apparently, because my right to life and the pursuit of happiness is not protected by the 2nd Amendment, it is secondary to someone else’s right to purchase an assault rifle. But I digress. This past weekend, all around the country, people marched in support of limits on gun ownership. Totally reasonable limits, such as those presented by President Obama this week: a national registry, background checks, and so on. While such displays of citizen activism are important in raising awareness, something with more teeth is required if we are actually going to change the availability of assault weapons on the open market. First off, we need to make it less attractive for people to own these weapons by mandating that they carry liability insurance and by taxing and regulating ammunition sales. But we also need to take on the profiteers, to discourage manufacturers from producing and stores from selling weapons capable of discharging multiple rounds in short order. Within the environmental community, there is a call for businesses, universities and individuals to combat global warming by divesting of stock from companies that profit from selling fossil fuels. Money talks. If it is no longer profitable to drill, frack and mine profits from the body of the earth, these companies might choose to look for profits elsewhere. Ideally by investing in next generation energy sources like solar, wind and geothermal. This strategy of divestment was used successfully as a tactic to combat apartheid in South Africa. It has been used to make tobacco sales less profitable, and tobacco companies into social pariahs. If enough money is withdrawn from companies that profit from something deemed morally reprehensible, those companies will finally change their tune. And if enough people start to see those corporations as the soulless purveyors of evil that they are, they will be less inclined to want to spend the money that lines their slimy black pockets. Which is exactly what we should be thinking about gun manufacturers and the retailers that make them easy to purchase. Pond scum, all of them. Divestment works most effectively if large shareholders participate. But if enough of us more common folks divest, and let companies know why we are doing it, we can make an impact as well. Sell any stock you own in companies that profit from guns. Put a filter on your investment funds so that you won’t ever own stocks in these companies again. Ask your employer to allow you to filter your retirement fund. Then take it bigger. Start a movement at your place of business or alma mater to get them to divest from weapons manufacturing. There is a populist movement right now to restore sanity around gun ownership. Let’s make the most of it. It’s time to stop making it easy for people to own unnecessarily dangerous weapons. It’s time to stop making it attractive for people to profit from the manufacture and sale of guns. And to do so we must ensure that we ourselves are not profiting and are instead leading the charge for change. Great thoughts Kimberly! Thanks so much! Very well stated, Kim. I enjoyed reading it very much. I support your (and my) “right to life and the pursuit of happiness” but I disagree with almost everything else. I lack your eloquence so I won’t try to get debate the issue with you, but I just wanted say this is impressive, nonetheless. I look forward to reading more of your posts in the future. On another note, it has been over twenty years, hasn’t it? Although we’re never great friends in school, you were always one of the few classmates that I held in high esteem. That hasn’t changed. Thanks Brian. It means a lot to me that you read even though you disagree. I think it’s really important to be able to discuss ideas with people that you know. It helps open all of our minds to see things from someone else’s perspective. I read your FB post about racial profiling and I have been thinking about it all day. I can’t imagine having that experience and how that might shape my opinion. I can hardly believe it’s been 20 years (or more!). It’s a good things our memories aren’t failing us quite yet 😉 And even though we weren’t close friends, I am glad we are still in touch! I definitely agree that open discussion is of the utmost importance if we are to evolve both individually and collectively. Hopefully in the future I can offer you some alternative perspectives with blog posts of my own. I expect I’ll lose some “friends” over the FB post; especially considering many of my friends are in law enforcement. Some people will see nothing but black and white regarding flashpoint topics but unfortunately the world is gray. One thing I did notice is that aside from one person, the people who liked the post and/or comments were all of Hispanic decent. When it comes to the police, the lines are very cultural. That in itself says something.